If learning to surf is on your bucket list, it’s time to stop making excuses and give it a go! 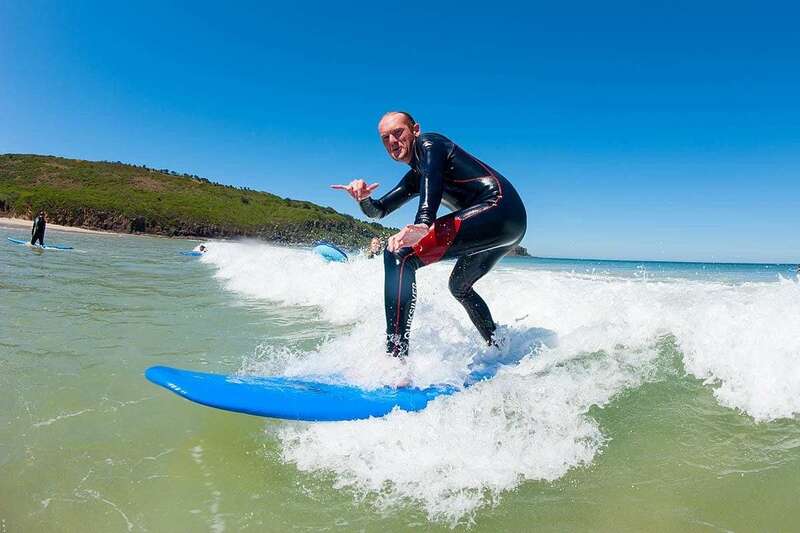 Surfing has it’s challenges especially as a beginner, but it’s very rewarding and the sense of achievement and exhilaration from catching that first wave makes it one of the best sports in the world to learn…regardless of age or experience! Do a little web research into how waves are formed and how to read them. This will help you recognise the areas where waves are breaking and catchable, as well as where rips or channels might be (to avoid). Ideally you want a spot that has a beach break (breaking over a sandbank), not breaking too shallow or close to the shore. A beach that is patrolled will make you feel safer. Seeing other surfers will confirm that it’s surfable, and don’t be too shy to chat with surfers about where to start. You need a board with lots of buoyancy and stability, and it doesn’t have to be new or in perfect condition. Soft-tops are popular choices for surf schools. Practice paddling your board on flat water (even in a pool), you’ll do more paddling than surfing so it’s a key skill. Analyse where you are on the board for the best stability and paddling, then practice getting into that sweet-spot quickly. While walking-out, never hold your board between you and the waves, the board will smack you in the face as the wave hits, and it hurts. Keep your feet together on the board while paddling, don’t spread them apart. Start by catching the whitewash just after the wave has broken. If you’re too far forward, you’ll nose-dive into the water, too far back and the wave will leave you behind. Feel when you’re being pushed along nicely and note your position on the board, now lean left slightly and feel the board turn, now lean back to the right. This playing around in the whitewash will give you a good feel for the waves and your position on the board. OK, now it’s time to stand up. Put your board on the sand, get into that sweet-spot paddling position and grab the edges of the board as if you’re about to do push-ups, now as quickly as you can, move into a squatting position dragging your feet quickly under your body and onto the board, feet slightly wider than shoulder distance apart, and get your arms out for balance. You’re up. Now keep practicing this and remember you can tweak your balance by shifting weight between your front and back feet. Now you’re ready, paddle out to just past where the waves break. Always face the ocean and not the beach. Choose your wave and as it’s approaching start to paddle to the beach but keep looking back at the wave, as soon as the wave reaches your feet & you feel that push from the wave, snap-up. If the wave passes under you, you may need to add an extra stroke or two before the snap-up or move your weight forward during the snap-up on the next wave. Whatever happens, relax and enjoy it, even if you’re being pummelled by the surf, you’re learning, and that’s all part of playing with the ocean. And remember the ocean is a mighty force, don’t fight against it, learn to play with it. If you fight against the ocean, the ocean always wins. 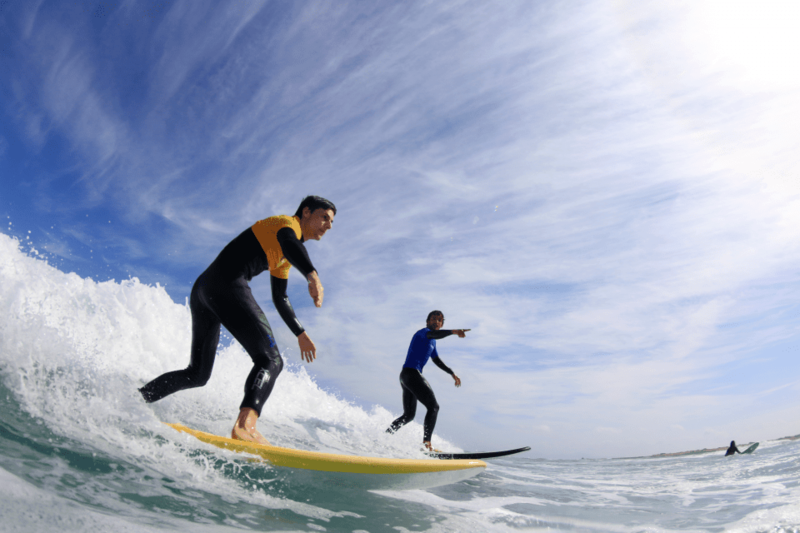 If these top 5 surf tips have inspired you, take a look at our surfing holidays and surf courses.